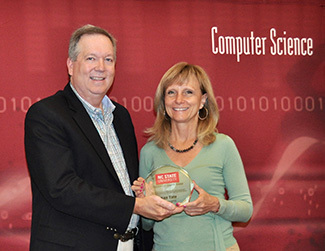 The NC State Computer Science Department is pleased to present the inaugural 'Person of Exceptional Performance' or PEP Award to Ken Tate, Director of Engagement and External Relations. In the fall of 2017, Tate led an extended team that planned and executed the celebration of the department’s 50th Anniversary. Events and activities included a special “Centennial Rocks” retro concert, an outdoor ‘Movie on the Oval’ evening featuring the CSC-themed movie – The Imitation Game, and a highly successful Technical Symposium and reception. He also orchestrated the sponsorship of a special Thursday Night ACC showdown between Louisville and NC State football game featured on ESPN. This included a pregame radio interview, program ads, in-game announcements and an on-field presentation that helped promote the department. Also part of the 50th year celebrations was the creation of a special 50th YearPublication and an update of the department’s history document. He also leveraged the 50th year celebrations to launch the department’s CSC Alumni Hall of Fame, featuring an interactive recognition wall and online site. Twenty-five outstanding CSC alumni were inducted into the inaugural class at a special event held at the Park Alumni Center, along with six outstanding young alumni who were also selected for special recognition. In addition, Tate has made a lasting impression on the department by his tireless focus on corporate partnerships and a passion for outreach. Under his leadership, the ePartners Program has grown to now include 18 Super ePartners and well over 100 different corporate partners engaged with the department at different levels. Last year, total support from the ePartner companies exceeded $1.2M, with a record of over $350K in completely unrestricted cash support. This year is not complete yet, but he has helped bring in a new record of more than $430K in completely unrestricted ePartner support! During his almost 17 years here at NC State, Tate has helped raise more than $13M to support the department. From an outreach perspective, Tate has worked closely with our department’s Strategic Advisory Board, industry partners, and College of Engineering Admissions for almost a decade to create a comprehensive outreach program designed to increase the attraction of females and under-represented students into the CSC discipline. His passion for outreach has led to a complete redesign of the department’s Future Students page with much more focus on diversity and changing the narrative about computer science and its application in improving the human condition. The campaign has engaged more than 10,000 middle and high school math, science and technology teachers over the years, with a graphic-intensive campaign, including a dynamic 'Faces of Computer Science' campaign. He launched the CSC Student Ambassadors program, a group of about 25 of the department’s very best undergrads. This diverse group regularly supports about 700 volunteer service hours annually giving tours, hosting Open Houses and other visits, and engaging prospective students and their parents. This and other related campaign components have led to a 30% year-over-year improvement in female applicants. In ten years, undergrad female enrollment has improved ~80%, increasing from about 10% to 18%. The incoming CSC class for the fall of 2018 includes 164 accepted female students, up 48% over last year! For this, and his day-to-day passion for making a difference in the department of computer science, the Computer Science Department is excited to award Ken Tate the inaugural 'Person of Exceptional Performance' or PEP Award!